Half of home heating fires are reported during the months of December, January, and February. Have a three-foot “kid-free zone”around open fires and space heaters. It’s a good idea to crack a window open for a fresh supply of air. which means that it can easily ignite anything that can burn. • On average, a candle fire in the home is reported to a U.S. fire department every 30 minutes. • Roughly one-third of home candle fires started in the bedroom. • More than half of all candle fires start when things that can burn are too close to the candle. 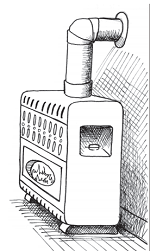 Have fuel-burning heating equipment and chimneys inspected by a professional every year before cold weather sets in. When using a fireplace, open the flue for adequate ventilation. Never use your oven to heat your home. In 2005, U.S. fire departments responded to an estimated 61,100 non-fire CO incidents in which carbon monoxide was found, or an average of seven calls per hour. outside to dry, then can be washed and dried as usual. Flipping a light switch. Plugging in a coffeemaker. Charging a laptop computer. These are second nature for most of us. Electricity makes our lives easier. However, we need to be cautious and keep safety in mind.Flipping a light switch. Plugging in a coffeemaker. Charging a laptop computer. These are second nature for most of us. Electricity makes our lives easier. However, we need to be cautious and keep safety in mind. Use ground fault circuit interrupters (GFCIs) to reduce the risk of shock. GFCIs shut off an electrical circuit when it becomes a shock hazard. They should be installed inside the home in bathrooms, kitchens, garages and basements. All outdoor receptacles should be GFCI protected. MAKE a home escape plan. Draw a map of your home showing all doors and windows. Discuss the plan with everyone in your home. Practice your home fire drill at night and during the day with everyone in your home, twice a year. While 71% of Americans have an escape plan in case of a fire, only 45% of those have practiced it. One-third of American households who made an estimate thought they would have at least 6 minutes before a fire in their home would become life-threatening. The time available is often less. And only 8% said their first thought on hearing a smoke alarm would be to get out! to fire, often extinguishing the fire before the fire department arrives. Only the sprinkler closest to the fire will activate, spraying water on the fire. Over 80% of fire deaths occur in the home. Home fire sprinklers can save lives and property from fire. They respond quickly and effectively to fire, often extinguishing the fire before the fire department arrives. Only the sprinkler closest to the fire will activate, spraying water on the fire. The cost of a home fire sprinkler system in a new home averages $1.61 per sprinklered square foot totaling an amount similar to what is spent for carpet upgrades, paving stone driveway or a whirlpool bath. Source: Fire Protection Research Foundation Study 2008. Fire departments typically use roughly 10 times as much water as a fire sprinkler would use to contain a fire. Source: Fire Protection Research Foundation Study 2010. Fire sprinklers are environmentally friendly. They can reduce the amount of water run-off and pollution, fire damage by up to 71%, and water usage to fight a home fire by as much as 91%. Source: FM Global and Home Fire Sprinkler Coalition Study 2010. The risk of dying in a reported home fire decreases by about 80% when the home is equipped with a fire sprinkler system. Energy-saving compact fluorescent light bulbs (CFL) are becoming more common in homes and at work. In addition to using less electricity, they also have a positive impact on the global climate. Here are some important safety tips you should know about CFLs. OPEN a window to allow the room to air out for 5–10 minutes. TURN OFF forced air heating and/or air conditioning. COLLECT broken glass and visible powder using stiff cardboard, tape or a damp paper towel. PLACE the debris in a glass container with a metal cover in a safe location outside until you can dispose of it . CONTINUE airing out the room for several hours. When a CFL bulb burns out it may smoke and the plastic base may blacken. This is normal and is not a fire safety issue. CFLs should never be discarded with household trash. The Environmental Protection Agency recommends that consumers use local recycling options for CFLs. Contact your local government or visit epa.gov/cfl/cflrecycling or earth911.org to identify. CFL bulbs contain a small trace of mercury within the glass. When broken, mercury will immediately dissipate into the air. Concentrations of mercury will likely approach zero in an hour or so. facts and the safety requirements for manufactured homes, you can help keep your family safe. CHOOSE a home built after 1976 that has the HUD label certifying that it meets certain minimum safety standards. Be sure your home has enough smoke alarms. You need a smoke alarm inside each bedroom, outside each sleeping area and in or near the family/live room area(s). For the best protection, interconnect all smoke alarms so when one sounds, they all sound. HAVE a home fire escape plan that includes two ways out of every room and an outside meeting place. Make sure all ways out of the home are easy to use. Practice your fire drill at least twice a year. If smoke alarms sound when you are cooking, consider moving the alarm further from the kitchen area or install a photoelectric type alarm which is less sensitive to cooking. CONSIDER having a licensed electrician inspect the electrical system to be sure it is safe and meets the applicable National Electrical Code® requirements. under the home. Store firewood away from the home. Smoke alarms are missing in half of all manufactured home fires. Since they are required to be sold with smoke alarms, this may mean people are removing them. convenience of the microwave oven is something we take for granted, safety should not be. 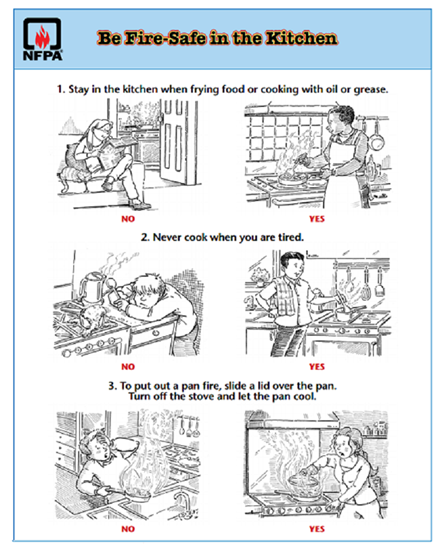 By following a few simple safety tips you can prevent painful burns and possible fires. NEVER heat a baby bottle in the microwave. Since a microwave oven heats unevenly, it can create hot pockets, leading to burns. Warm a bottle in a bowl of warm — not hot or boiling — water, or by running it under the tap. aluminum foil or metal in a microwave oven. If you have a fire in the microwave, leave the door closed, turn the oven off and unplug it from the wall. If the fire does not go out, get outside and call the fire department. Scald burns are the leading cause of injury from microwave ovens. Portable medical oxygen in the home has grown over the past decade. Medical oxygen adds a higher percentage of oxygen to the air a patient uses to breath. Fire needs oxygen to burn. If a fire should start in an oxygen-enriched area, the material burning will burn more quickly. 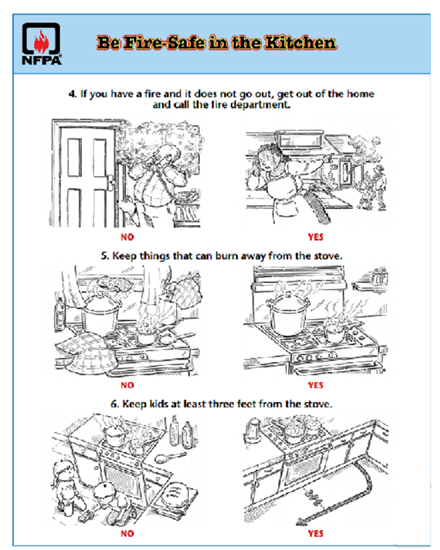 Homes where medical oxygen is used need specific fire safety rules to keep people safe from fire and burns. There is no safe way to smoke in the home when oxygen is in use. If a patient is on oxygen, they should not smoke. Candles, matches, wood stoves and even sparking toys, can be ignition sources and should not be used in the home. Keep oxygen cylinders at least five feet from a heat source, open flames or electrical devices. Body oil, hand lotion and items containing oil and grease can easily ignite. Keep oil and grease away where oxygen is in use. Never use aerosol sprays containing combustible materials near the oxygen. Oxygen saturates fabric covered furniture, clothing, hair and bedding, making it easier for a fire to start and spread. Smoking materials is the leading heat source resulting in medical oxygen related fires, injuries and deaths.